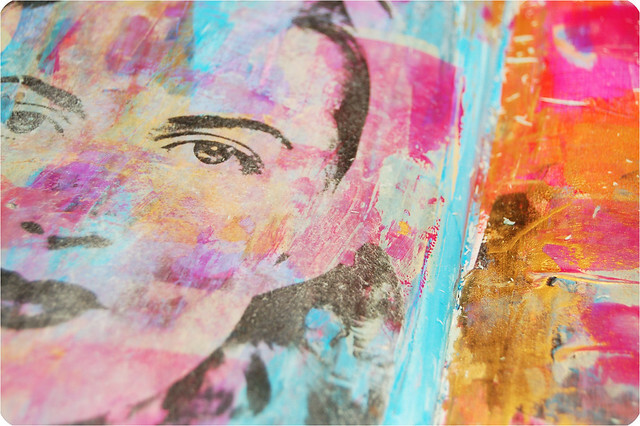 Did you know you can create your own Image Transfer in your Art Journal using matte medium? It’s a bit time consuming to do, but fun to try. You can transfer images to canvas or any other flat surface too. Why not let it be the start of a new art piece? You cover the image of choice with the matte medium and then turn it face down onto a prepped surface. It is like you are hiding the image by gluing it face down. Burnish to make sure it sticks but leave a few edges so that you have a starting point when you peal it of later. Once the medium is dry you wet the image with water and rub away the paper by carefully rolling it with the tip of your fingers. The smooth paint surface that you create when you paint with a plastic card is perfect for an image transfer or some journaling. I don’t do image transfers very often because it is time-consuming, but I really like the result of this page. What do you think, isn’t it a rather fun technique? BTW, I am using this Matte Fluid Medium, but I believe any transparent matte medium will work – but giving different results perhaps. Plus, don’t forget it’s perfect to use as a light glue for napkin decoupages for example. 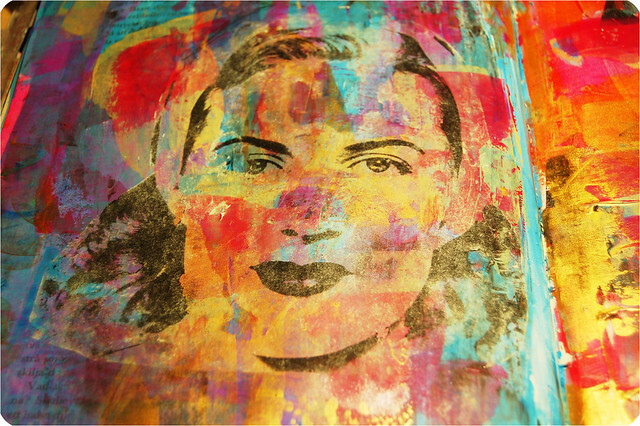 This is just one of many ways that you can do an image transfer. Let me know if you try it out! This entry was posted in Art Experiments, Art journaling and tagged acrylics, how-to, image transfer, prompt. Bookmark the permalink. TIP: Sometimes if you do this from magazines, the paper won’t come off all the way and the image is really cloudy. If you rub a little oil (jojoba or olive) the paper becomes translucent and the transferred image much clearer. Of course if you are adding layers on top or using markers the oil can ruin the marker so watch out. You can also add a layer of gel medium on top and then it won’t be oily. Credit for this is Rebekah Patnode, who unfortunately doesn’t have a blog or I would link here. I have also found that putting a coat of clear nail polish gets rid of the cloudy image and helps protect the image from wear and tear. can I transfer a toner copied picture onto a prepared wooden surface board? by prepared I mean it has a white coating already on it. I don’t want to waste either, the picture or the board so I wanted to ask first. first, but I don’t want a paint around this picture. Judy, it’s not a works-every-time kind of thing, so I suggest you practice a few times on other surfaces if this one is precious to you. But yes, it should work on wood too, painted or not, although the background might show through of course. Great transfer, thanks for explaining the process! wow, the painting and the transfer is a lovely combination. quick questions- does it have to be a photocopy or can it be a printed image- say from a home printer? If the later, does it have to be a laser printer? Great color and wonderful transfer!! Thanks for commenting! Just like CT says above you can do this with magazine images and also prints from your home printer! I’m not sure it would work with laster prints, so no, you don’t need a laser printer! :-) I hope you will try it out and let me know what works for you! Really gorgeous. I love the look of black pattern on color, or black lines on color. Hmm, time to get to down to the basement and work on something! Thanks for the post, Hanna! Hope it works with laser printers. I’ll try & see. Thanks for sharing this process & love the how yours turned out. That looks great what a nice and simple new way (for me) to transfer an image…very cool. I love this so much! I don’t have matte medium but I’m definitely going to give this a try! Ahhh… thank you! A Portugese friend of mind had sent me some mail art using this technique. He tried to explain it to me, but our language barrier left it too ambiguous. Now I know! I sometimes use the technique on textiles, as a background or complement for embroidery. I use my own photos, cut them and mirror them in Photoshop and then print the image. Nothing has happened so far with the blog. I need your help! But as soon as I have a blog I will be able to show you what I do. What weight is your matte medium? Festive image transfer! It’s an effect that’s hard to get any other way. It’s fun to see the face mixed with you lovely painted surface; wonderful! Thank you so much for visiting my blog and for your comment. And I LOVE this image transfer and you know I am digging those colors!!! I have tried image transfers before and I love the effects and sometimes it works and sometimes it doesn’t. You have an excellent transfer here!!!!! I got here eventually…so thank you again for your visit and lovely comments! Hanna, you did this SO well! I have never done one of these. I have thought about it before, but I am scared it won’t work for some reason so I’m just being silly. I love my matte medium. I use it all the time. I think it’s my favorite supply! You’ve made some beautiful pages, here. Jen, the best thing about matte medium is that it doesn’t matter what brand you use – all of it is sticky like glue! I’ve used one from Liquitex and it says matte medium or matte gel medium on the bottle/tube. I hope you try it out! Hey Mimi, thanks for commenting on my blog too, and thanks for the flickr message, I was thrilled that you wrote me! I love your embroidery and have added you to my Link Love List. Your artwork rocks! This is such a great idea! I love image transfers and haven’t done any in a while! 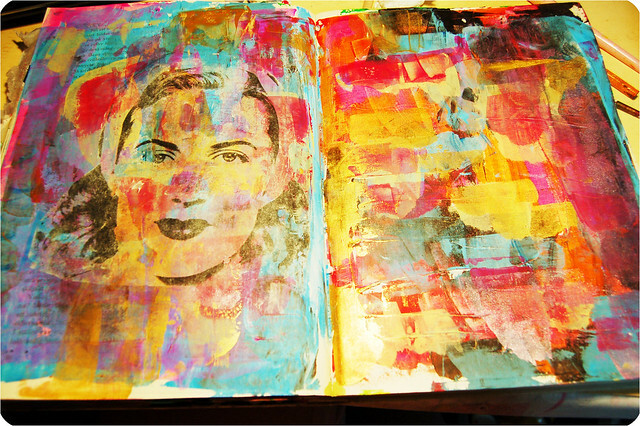 An image transfer is a great idea for a spread I am doing right now! I have the perfect image and I am trying it in a sepia tone to see if that works??? I’ll let you know how it turns out! 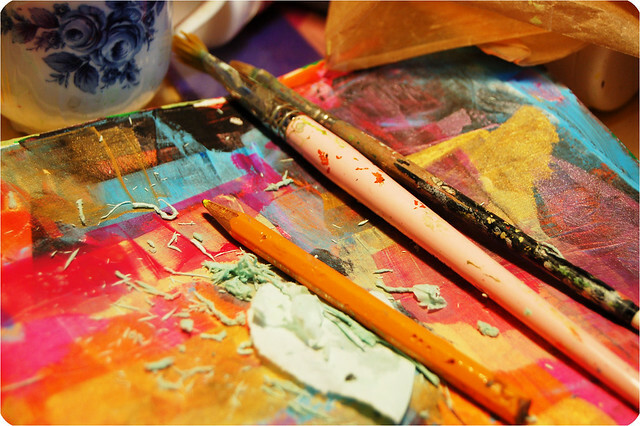 Can you use Creative Inspirations Acrylic Medium Polymer Medium Matte as a glue? Its worded differently than what you described above……. Its just that I found it at a very reasonable price, I havent bought it yet because I was unsure. I am trying to find something to use as a glue as well as a sealer………. I don’t know about specific brands, but to my knowledge any acrylic “matte medium” can be used as a glue, for transfers and as a sealer. It’s not the best glue in my opinion, but for thin papers like tissue paper and napkins it’s the best. I suggest you buy it and try it out. Hi Hanna, I love your work. Which gel did you use exactly ? Thank you ! hi Valérie, thanks for stopping by. I updated the post (it’s a almost 7 years old now) with a link to the matte medium I’m using: Liquitex Matte Medium, I hope that helps. Have fun with your image transfering!